The goal that every football team sets during the first day of practice in August is to be playing after Thanksgiving for a state championship. That’s not a goal at Bishop Miege High School in Roeland Park anymore, that’s an expectation. The Stags will be playing for their fifth consecutive Class 4A state title on Saturday afternoon in Topeka when they face Goddard (10-2). Goddard, on the other hand has been one of the most surprising teams this season. The Lions were thought by some to be in a rebuilding year, as they are under first-year head coach, Tommy Beason. Beason has been a part of the Goddard coaching staff in the years past, but he took over for Scott Vang following the 2017 season. The Lions finished runner-up in class 5A in 2016 and lost in the 5A semifinals to eventual champion Bishop Carroll last fall. So the Lions have become accustomed to practicing late into November over the past few years. The Lions have had a tough path to Saturday’s state championship game. They lost to Maize, 27-2 in week 5 and then two weeks later they would lose to Maize South, 23-22 in double-overtime. When the playoffs came around, the Lions would have to travel in the quarterfinals and semifinals after hosting the first two games. The Lions defeated Towanda-Circle in the first round and then beat Andover Central for the second time this season. The road then got much more challenging as the Lions rallied at Wellington in the quarterfinals to beat the Crusaders, 28-14 after trailing 14-0 in the first half. The Lions then came from down 14-9 at McPherson to upset the top-seeded Bullpups, 15-14 last Friday night. Bishop Miege on the other had has won five straight games since losing at St. Thomas Aquinas (playing in 5A state title game) in week 7. The Stags’ only two losses came to teams that are still playing in the playoffs with Aquinas and Rockhurst (Mo.) who will play in the Missouri Class 6 state title game. The strength of the Eastern Kansas League and high-profile, non-league opponents has always helped prepare the Stags for the postseason according to Holmes. 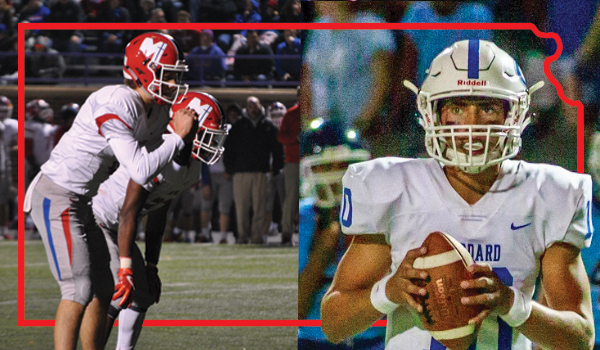 Both teams had to replace all-state quarterbacks heading into this season, as Goddard graduated Blake Sullivan (Fort Hays State football) and Miege with the graduation of Carter Putz (Notre Dame baseball). That hasn’t stopped either team from making another deep run this fall, as the Lions have turned to sophomore Kyler Semrad and the Stags have went to senior Sam Pedrotti to fill the roles of the previous all-state players. Pedrotti has thrown for 2,153 yards on 147 completions, 24 TD’s and 9 INT’s for the Stags. He has also rushed for 205 yards and 4 TD’s on 70 carries. Junior Brison Cobbins has done a lot of the work on the ground for the Stags, having rushed for 1,168 yards on 183 carries and 20 TD’s. Cobbins has had five games of 100 yards or more on the ground. Senior Dylan Downing has been everywhere on the defensive side of the ball, as he leads the Stags with 115 tackles, 3 sacks, 5 interceptions and 1 fumble recovery. Semrad on the other hand has thrown for 1,819 yards on 149 completions, 16 TD’s and 10 INT’s in his first year as the starting quarterback for the Lions. Senior Ben Bannister is the guy the Lions go to on the ground, as he’s rushed for 1,114 yards on 167 carries and 12 TD’s. Bannister also has five games of 100+ rushing yards. Junior Dhimani Butler is leading a well-balanced Lions defense with 97 tackles to go along with 3 sacks, 4 forced fumbles and 2 fumble recoveries. While the Stags have been known for their offense, the Lions are leaning more on their defense heading into Saturday’s game. The Lions have forced 32 turnovers thus far, 16 interceptions and 16 fumbles. Goddard’s defense has held their last two opponents scoreless in the second half and are hoping to carry that momentum into Saturday. Holmes has been extremely proud with how his team handled the adversity early in the season after losing to Rockhurst (Mo. ), a game that ended the Stags’ 29-game winning streak.